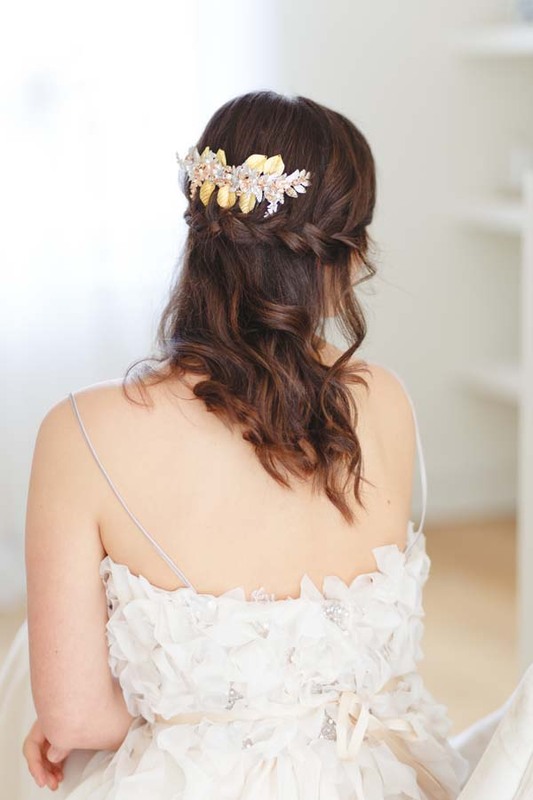 A large bridal headpiece in a beautiful ombre blend of metallics including gold, silver and rose gold. dozens of leaves and orchids adorn the head either at the back or on the side. Available in multi as shown or in all gold or all silver. 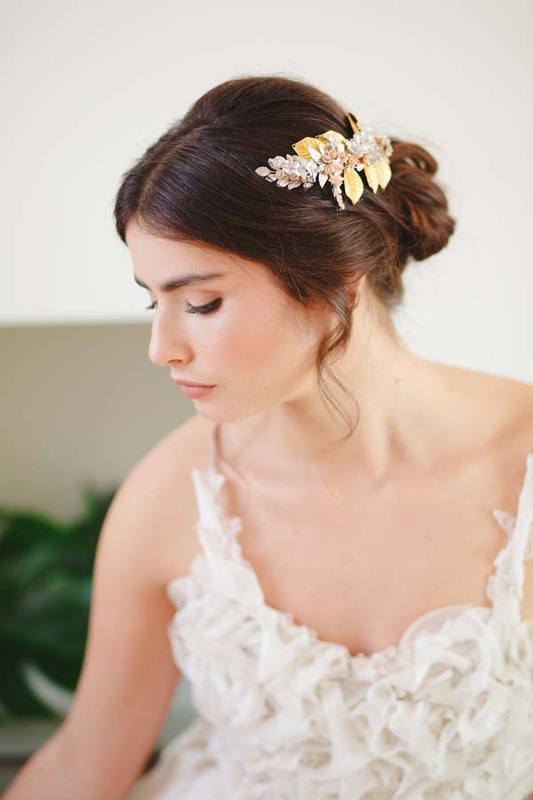 A beautifully shaped bridal hair comb adorned with wide metallic leaves in silver or gold set with rose gold plated orchids and freshwater pearls onto two small hair combs. 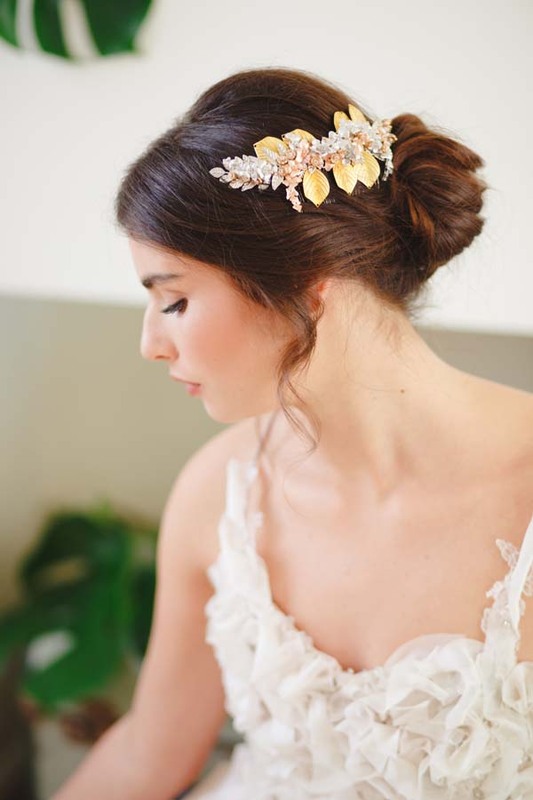 This gold bridal hair comb is also available in silver with rose gold and ivory or blush pink freshwater pearls. Stunning, statement headdress hand wired with hundreds of silver bugle seed beads and tiny freshwater pearls, coming together in a head piece that starts at the ear and covers all the way over to the other side of the head. The whole piece is set on a thin silver-plated headband, wrapped in pale gold or brown ribbon for a comfortable and secure fit. A beautiful piece reminiscent of tiny icicles that would look stunning on a winter bride. Handmade in the UK. As this piece is made to order, please allow 4-5 weeks for delivery. Large statement vintage style side tiara, composed of two heavily beaded pieces in shades of silver or silver/gold (pictured) which are accented with freshwater pearls and vintage aurora borealis crystals. This headdress is backed in our beautifully soft, signature tan suede, and is set on a narrow silver-plated headband wrapped in pale gold or brown ribbon for a comfortable and secure fit.